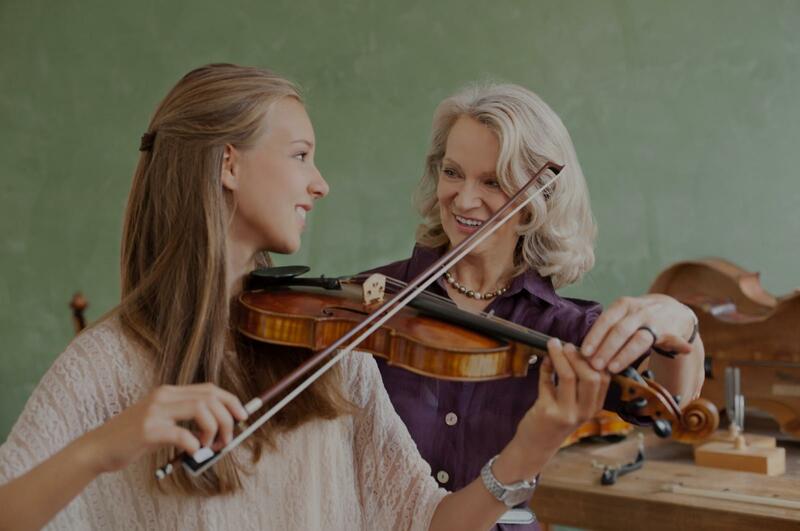 Corte Madera, CA Violin Lessons Near Me | Fun Classes. Top Tutors. Check out some of our most popular teachers near Corte Madera, CA including San Francisco, Sunnyvale, Oakland, Palo Alto and Redwood City. I emphasize tailoring lessons to the students' age level, ability, and learning style. Method books that I use vary depending on these factors. For my young beginners, I start with the Adventures in Violinland method books, which were written by my teacher, the famed pedagogue and Juilliard Pre-College faculty member Shirley Givens. I do also teach out of the Suzuki repertoire books as well as supplementing with scale books, shifting exercises, etudes for left-hand facility and bow technique, and more. In my studio, there is an emphasis on high standards for playing, strong practice techniques, music theory and ear training! I'm Mia, a professional violinist in the San Francisco Bay Area. I've been playing the violin for over 18 years, and bring with me 9 years of experience in private lessons, chamber music coaching, and music theory and ear training. I believe that music is a powerful tool, and encourage my students to have fun while playing and practicing the violin! Studying the instrument teaches discipline, self-expression, dedication, and many other valuable skills. icipate in All-City Orchestra, and gain entry to the Ruth Asawa San Francisco School of the Arts. I offer private violin lessons through my studio in Oakland, California, but I am also available to travel to your home if it is in the Oakland/Berkeley area. If you are in San Francisco and would like private lessons, please contact me as I accept students in the city on a case-by-case basis. Playing the violin is a challenging and rewarding endeavor, so I ask that my students commit to a weekly time slot and expect to practice every day; practicing and regular lessons are the best way to master the instrument and be satisfied with your own progress! I do not provide a violin or the necessary accessories to my students, but I am happy to provide recommendations for where to acquire or rent them; please come to your first violin lesson with an instrument and bow, as well as tools like a shoulder rest, metronome, rosin, etc. I will provide sheet music for the first lesson or so, but expect to order the books that we will use after that point. I have been on the faculty of Little Mission Studios, the Chamber Music Institute of the University of Maine, and a chamber music coach at the Kipp-Bay Academy. I currently maintain a studio at Inspire Music in SF with over 25 private students in addition to my home studio in Oakland, so it's easy to say that teaching the violin is a passion of mine! Violinist Mia N-H is quickly gaining recognition as a versatile and dynamic performer in the San Francisco Bay Area. Her passion lies in pushing the boundaries of classical music through self-expression and collaboration with other musicians, composers, performance artists, and dancers. She has performed in major venues including Carnegie Hall, Symphony Space, The National Arts Club, The Legion of Honor, and The Masonic, as well as on the world stage in Italy and Switzerland. Mia has performed with leading artists and groups such as Opera Parallele, Brad Mehldau and Joshua Redman, Elevate Ensemble, David Kim, Gamelan X, David Tanenbaum, Bettina Mussumeli and Jean-Michel Fonteneau. She is also the resident violinist for the contemporary chamber music ensemble Wild Rumpus, a collective dedicated to the performance and commission of innovative new works. In the realm of pop and indie music, Mia has recently collaborated with The Singer and The Songwriter on their track "Apparent Brightness", recorded for Marcus McCauley and Portrait Maker, and performed with Evanescence on their "Synthesis" tour at The Masonic. Passionate about the creation and performance of new music, Mia has recently premiered works for Jake Heggie, JooWan Kim, Brian Fitzsousa, Nick Vasallo, and Dan Van Hassel. Her performances are often in conjunction with movement or performance art, most notably AXIS Dance company's piece "Radical Impact", performances at the SF Movement Arts Festival, and collaboration with the Juxtapositions Chamber Ensemble and Cellista. Mia studied the violin with Shirley Givens and Akiko Silver, as well as at the Mannes Pre-College Program in New York City before moving to California in 2010. She earned her BM in 2014 and her MM in 2016, both from the San Francisco Conservatory of Music studying under the tutelage of violinist Bettina Mussumeli. While at SFCM, she was concertmaster of the Conservatory Orchestra and the recipient of the Sergei Barsukov Violin Scholarship. She has also studied chamber music with Mark Sokol, Mack McCray, and Paul Hersh, and has performed in masterclasses for eminent musicians such as David Kim, Sidney Harth, Claude Frank, Stefan Milenkovich and Daniel Philips. Mia is one of the warmest and kindest violin instructors I have ever had. Not only is she a wonderful person- she is also an extremely skilled teacher! With her help, I was able to play like I never have before! She helped me improve my sound and intonation so much!! I hate that I moved away for work, I would still be taking lessons with her if I could! Whether you're a beginner looking to explore a new instrument, or a young professional preparing for an orchestral or college audition, I'm eager to share my passion of music and teaching experience with you. Throughout my teaching and performing career, I have been highly successful at helping students bring out the very best they can offer. Many of my students got accepted to study at major universities and music conservatories, and/or earned positions at orchestras or teaching institutions. I'm strict and have very high expectations, but I was also praised for being encouraging and supportive. I strongly believe in the power of music, and the many benefits of learning a musical instrument. Music has been my greatest passion all my life. Originally from the former Yugoslavia (of Hungarian descent), I earned all my degrees in violin performance: an Artist Diploma (5 yrs.) from the Franz Liszt Academy (conservatory) of Music in Budapest, Hungary, a Master's Degree from SIU-Carbondale, and a Doctor of Musical Arts degree from the University of Wisconsin-Madison). I've been teaching for 22 years, of which 18 years also as a full-time university professor (mainly at the University of Idaho). Currently I teach at several locations in Las Vegas and Henderson, NV. , and Wisconsin Chamber Orchestra). We live in a small place that doesn't have a violin instructor, and although my spouse was initially skeptical about trying lessons online, we are now so happy we did it. Ferenc knows his profession very well, and it is so convenient to get the lessons online. Ferenc is simply the best teacher and performer we've come across. Both of our kids are currently working with him, and they are progressing very well. His fees are reasonable for the expertise my kids are getting. Highly recommended! I am very happy to have found Ferenc. He is very nice, friendly and helpful. He really helped me with my goals. I really recommend. Have you been wanting to try the violin, but are afraid you don't have good pitch or rhythm? Let me help you sound good and feel good! Whatever your musical abilities and knowledge, we can work together to get you where you want to be. I have an M.M. in violin from Cincinnati Conservatory, and a PhD in ethnomusicology from UC Berkeley. I have performed in symphonies, Early Music ensembles, chamber music groups, and international folk dance bands, and I especially enjoy strolling violin. But my true passion is helping students like you have a rich and rewarding experience learning violin. I grew up in Israel listening to my parents' bluegrass band, and I enjoy playing everything from Old Time fiddle to klezmer. My training is classical, with an M.M. in violin from Cincinnati Conservatory. I believe that solid technique can give you a foundation for learning any kind of music. Although I have a particular course I recommend for beginners, I'm happy to help you learn whatever music inspires you. I've always liked learning about music too, and I integrate music theory and history into lessons. Understanding the harmonic structure of a piece can help you learn it more easily, and knowing about the composer and the style can give you insight into how it might be performed. Together they create a richer learning experience. m especially interested in violin music around the world. I still teach musicianship at UC Berkeley and can help you with sight-singing if you like. Can't find a teacher in Corte Madera, CA? tanding of music and a good musicality. Within the 6 months of learning, my son can play many lovely songs, like Jingo Bells, Odd to Joy. He has made tremendous improvement, and can move his fingers on G, D, and A string freely, and can read the notes faster than we do. Lin provides different versions of violin classes, one for adults and the other for kids. She is a wonderful teacher, helps us enhance our knowledge of musical theory and definitely violin too. We highly recommend her." "Kristen is warm, engaging, and knowledgeable. My daughter is very excited for her next lesson." ates the right positioning of the hands, but the music and emotional expression is on the first place. She combines the best of the Russian music teaching tradition with very attentive and fun environment for kids. She is very sensitive to child's needs and structure her lesson very individually . Not to mention her excellent communication and reliability. She also has a very positive attitude and my daughter is always looking forward to her violin lessons. Thank you, Larisa!" San Francisco, CA teacher: Larisa K.
keeps the class challenging and fun. She is a careful listener and pick-ups on important techniques the student needs for practice. She will pick songs for students to learn for fun. Last Christmas, she taught us "Jingle Bell" and my kid just played it in our family party. It was wonderful! We are lucky to have her as our music teacher." "Lin is patient and encouraging. My son enjoys the lessons and is motivated to practice and improve." oved Kristen! Kristen met her needs in every way, was very pleasant and professional. Highly recommended!!" "Lin is absolutely the best. el' for the music. With every class, I have been more inspired to practice more and learn better - thats just the kind of teacher she is. She is super patient with me and I always look forward to her classes. Thanks Lin for everything :)"